StampOwl's Studio: You Quack Me Up! It's challenge time with my friends over on the CCEE Stampers challenge blog. Being a brand new month it is time to introduce our new challenge hostess which is Lois Bak. Apparently today (May 4th) is National Candied Orange Peel Day. To celebrate, let's include the color orange on our cards. I thought it was about time I played with the Sliding Card dies I received in March for my birthday. I used the SugarPea Designs Quackers stamp set to decorate my card. To allow for the extra layers of cardstock in the panel in the centre which extends when you pull the sides. I added three layers of the sliding frame to each side to make it easier to slide. I also used the Memory Box Splashing Puddles die to create the pond on the centre panel. Oh, so cute! I haven't seen these dies before. Love those little ducks. I got a real kick out of this fabulous card today with its frolicking ducks! My card has a framed duck, too, today! I love this amazing sliding design, Frances! What adorable faces on those happy ducks! Love your design, Frances! Happy happy card! 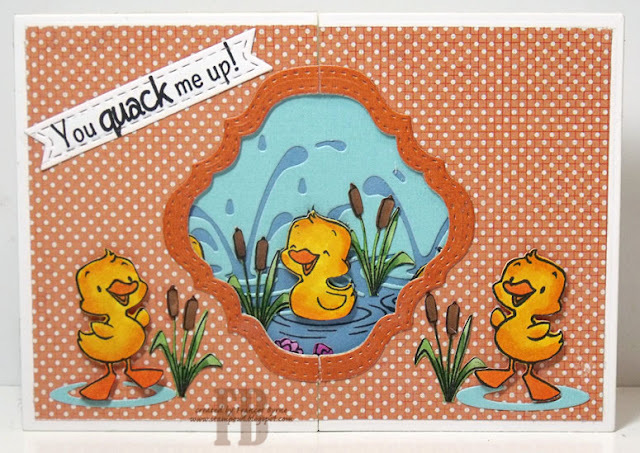 What a fabulous sliding card......I adore the faces on those little duckies, and your card, as usual, is wonderful! What a fun, fun card! Love those duckies and the sentiment is super! I look forward each week to your card, Frances. It is always fun and exciting and this one fits those works perfectly. I love the way the slide card opens up to the scene showing all the fun these little yellow duckies are having.